Did you remember to set your clock back 1 hour if you are in the States? 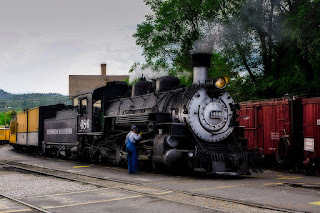 😉 My image today was taken after I road the Durango and Silverton train. We had just got back to Durango and I was walking around and going to the museum when the last train of the day pulled in. They were checking things out before they took the cars to park for the night and locomotive to the Roundhouse.